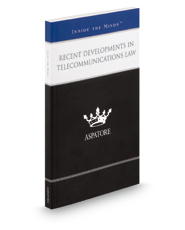 Recent Developments in Telecommunications Law provides an authoritative, insider's perspective on understanding how Internet trends and the increase in wireless technology impact current and future regulations. Experienced partners from law firms across the nation counsel clients on keeping up-to-date with regulatory requirements and identify effective strategies for complying with them. These top lawyers offer specific advice on understanding the role of the National Telecommunications and Information Administration (NTIA), evaluating the applicability of the 1996 Telecomm Act on today's carriers, and analyzing the growth of Internet Protocol (IP) services. Covering a range of topics from monitoring the demand for a more usable wireless spectrum to analyzing the impact of the National Security Agency's (NSA) information gathering activity, these experts underline the various roles of telecom regulators and stress the importance of protecting privacy rights. The different niches represented and the breadth of perspectives presented enable readers to get inside some of the great legal minds of today, as these experienced lawyers offer up their thoughts on the keys to success within this dynamic legal field.